The kinds of systems with which most people are familiar are machine-like. They can be natural like a plant or animal. They can be artificial like a computer or a motor car. Their functionality is realised by a fixed set of inter-linked organs like the brain and the heart, or devices like a CPU, a disk drive, an engine or a gearbox. They are all centrally controlled. They have a fixed structure. They are not scalable. If you join them together you do not simply get a bigger one. If you chop one up into arbitrary pieces, you do not thereby create a lot of perfectly working smaller ones. In their futile attempts to impose centralised control over society, governments create models of society which resemble machines. The results prove that human society is definitely not a simple deterministic machine. A complex dynamical system is fundamentally different. It is not machine-like. It does not have a fixed structure: it is fluid. Its total functionality is resident in its entirety within each of its minutest component parts. It does not possess funct­ionally-dedicated organs or devices. It cannot be centrally controlled. It is infinitely scaleable right down to its basic parts. So however closely or distantly you look at it, it always looks - and indeed is - the same. Its structure is what is termed fractal. Human society is much more like a complex dynamical system made up of the 7 billion human individuals who inhabit this planet. Its highly distributed control system is made up of 7 billion loosely connected 200-billion-neuron human brains. Its power therefore pales into insignificance that of the largest corporate and government super-computers that are used to try to impose a bureaucratic superstructure upon society. But how does society, as a system, work? Undoubtedly the most familiar example of a com­plex dynamical system is the Earth's atmo­sphere, or more specifically, the global weather system. Like any kind of system, a complex dynamical system needs a source of energy to drive it. Everything on Earth - especially anything which is of a global scale - is driven principally by the sun. The weather system is driven by the daily and annual cycles of solar heat and, in addition, by the gravity of the moon. It is thus driven by three different periodic energy sources. Through its subsequent motion it dissipates this energy. The weather therefore belongs to a particular class of complex dynamical systems that are both peri­odically driven and dissipative. This class of com­plex dynamical systems exhibits certain distinct­ive modes of behaviour. A fleeting carousel of autumn leaves drifting along the pavement. The calming melody of a summer rain. The violence of an equatorial storm. The searing heat of a tropical desert. The still grip of an arctic winter. Each has a finite existence in time and space. 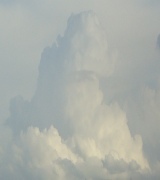 Each is a different manifestation of the forces which continually converge and disperse within the atmosphere. They are just some of the wide variety of features which make up the normal mode of behaviour of our global weather system. The weather follows an annual cycle yet never repeats exactly. In some situations it can be predicted accurately in the short-term. In others it is completely unpre­dictable. It is chaos superimposed on regularity. Nevertheless, from breathless calm to raging storm, from icy stillness to churning heat, its parameters can never violate their decreed bounds. No matter how complex its behaviour may be, it always exhibits order. I feel that the term chaos, which has been coined to describe this complex form of motion, is an unfortunate misnomer. It is never a case of 'anything goes' or 'no holds barred'. Though it may not be regular, it is never random or formless. It obeys mathematical rules. It is held within its decreed limits, which can be seen taking shape on a computer screen as a butterfly shaped graph, which has become known by mathematicians as its strange attractor. It is now thought that even the ice ages, which sporadically envelop the temperate latitudes, are merely extreme excursions within the weather's normal mode of behaviour. As such, it is still held within the pull of the same strange attractor, which has two or more limbs between which the climate's behaviour can flip. The weather is thus bound always to return from such wild excursions back to its long-term norm. But this is not the only mode in which the Earth's climate could operate. To forecast the weather, meteorologists model its be­haviour in terms of differential equations. While ex­ploring the behaviour of these equations by computer, they discovered that, if the atmosphere were subjected to a large external jolt, the global climate could be flipped into an entirely different mode of behaviour. 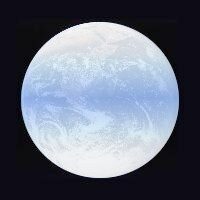 They called it the White Earth because in this mode, the whole earth would be covered with snow and the oceans would be surfaced with ice. The atmosphere would be thinner. Weather features such as storms would be much smaller but far more violent. Life would be hard. In White Earth mode, the climate would be held within the in­fluence of a different strange attractor. So once the climate had been knocked into White Earth mode, it would require another large external jolt to knock it back to normal. Furthermore, the equations show that a White Earth may not be the only stable alternative to our present global climate. 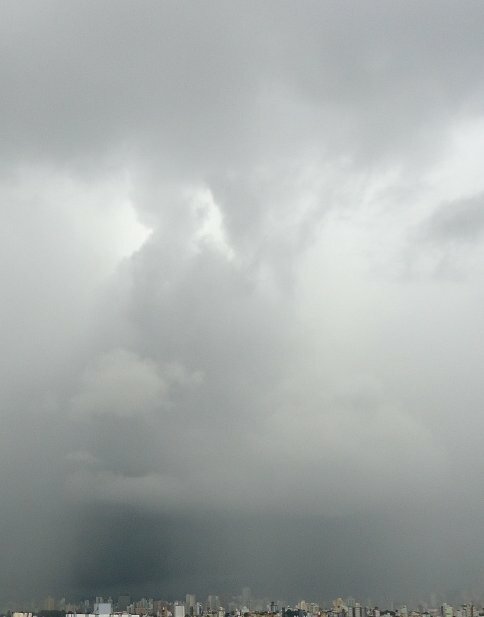 A complete definition of the behaviour of a complex dynamical system like the global weather would therefore probably involve many possible modes of behav­iour. Some modes may be trivial, for instance where the atmosphere remained completely still. Others may be active but unable to support life, for instance where all motion were simple and periodic. In this case, the absence of turbulence would not facilitate the rapid mixing and dispersal of gasses and moisture vital to life on this planet. Both the normal mode and the White Earth mode exhibit very complex motion. Behaviour - however complex - is the effect of a cause upon a system. Any system converts a particular cause into its effect according to the dictates of the particular laws of physics which that system embodies. In machine-like systems, the relationship between cause and effect can normally be observed and measured. The law relating cause and effect can then be written down mathematically and hopefully understood. In complex dynamical systems, however, the relationships between cause and effect cannot be determined directly. One must look at the system's smallest constituent parts. In the case of the weather, these parts are the molecules of gas and vapour which are found in the Earth's atmosphere. These are tiny systems in their own right. They embody physical laws. Each pro­duces a determinable effect when subjected to a given cause. For instance, the relation between cause and effect for the impact of a solar photon on an atmo­spheric molecule is of itself reasonably simple. However, the composite behaviour of zillions of photons impacting on zillions of molecules which then go on to collide with zillions of other molecules in a never-ending interlacing cascade of action and reaction, is unfathomably complex and in­determinable. Thus the apparent chaos of the weather is merely the result of count­less tiny machines engaged in simple interactions in endless iteration. Yet in all the turmoil of our planet's weather system, neither the form nor funct­ionality of these tiny machines is ever violated or destroyed. The atoms and mole­cules of the atmosphere collide, combine, separate, move on and then recombine according to prescribed laws - laws which govern how they interact and guarantee their individual preservation. The integrity of each of these tiny natural machines is protected by an unassailable energy barrier. The preservation of each is assured by the fact that the energy needed to break the bonds which hold together its internal members is many orders of magnitude higher than the greatest energy unleashed by the weather. Earthly storms could never achieve the fury required to tear apart the elements of the atmosphere into their constituent fundamental particles and fuse them into heavy, dangerous radioactive elements which would wipe out all the life on the Earth. Such behaviour could occur only within the 'weather systems' of the stars. It is way beyond the limits set by our terrestrial weather system's strange attractor. The survival of each of its basic components is thus assured. Shaped by the myriad interactions between countless tiny mechanisms according to simple physical laws, the complex-but-bounded behaviour of our global weather system is - barring external catastrophe - destined to continue to provide the ideal vessel for human life and civilization. The atom, the molecule, the human individual and the family are structures whose forms are determined solely by the laws of nature. All are made of parts which are strongly bound together. An atom is made up of "particles" like leptons and quarks. A molecule comprises an arrangement of atoms. A human being is made up of a body comprising various specialised functional organs, which is host to a sentient self. A family is made up of members like husband, wife and children. Atoms and molecules behave like zillions of tiny structured mechanisms, which to­gether form a complex dynamical system such as the global weather. Individuals and families behave as billions of tiny structured machines, which together form a complex dynamical system called human society. All can be torn apart by strong external forces. The atom can be broken apart by nuclear fusion or fission. The molecule can be reduced by chemical agents. The individual can be destroyed by physical force. The family can be dismembered by economic pressure or moral decay. All are minute autonomous parts of a greater whole. Members of both make excursions into their outside communities and then return. An outer electron will leave its atom or molecule causing it to become 'ionized'. Members of a family will take a trip outside their home in order to trade, travel, communicate or socialise. Both require space and time in which to exist and func­tion. The molecule needs its mean free path. It shares available space equitably with its neighbours according to the prevailing temperature and pressure. The family needs its fairly apportioned working space to transform its labour into its needs of life. Both interact with their neighbours under the influence of forces whose effects are determined by natural physical laws. Each mole­cule owes its shape and structure to the subtle interplay between the fundamental forces. Each family owes its form and structure to the subtle interplay between biological function and social interdep­endence. Molecules interact with each other under the influence of the weaker physical forces. Families interact with each other under the influences of the sociological forces. As it is with every inter-molecular interaction, so it is with every inter-family inter­action. The nature of the effect resulting from a given cause under the influence of a given force is determined inexorably by a natural law. The human family too is a tiny socio-economic system in its own right. It too em­bodies laws - the laws of social interaction. Each produces a determinable effect when subjected to a given cause. For instance, the effect of mutual benefit when two parties exchange goods or services in an act of trade, or when friends exch­ange news through conversation. A single socio-economic transaction is of itself quite simple. However, the holistic vision of zillions of social transactions taking place at once between millions of different people across the globe in a never-ending interlacing cascade of initiative and response, is unfathomably complex and in­determinable. So the apparent chaos of global humanity is merely the result of a myriad encounters between countless people in endless iteration in an ocean of ever-changing patterns of turbulence and calm. Turbulence in the atmosphere is vital. Without it, the rapid mixing and dispersal of gasses and moisture essential to life would not take place. In human society, the turbulence produced by the sociological forces makes people mix with others whom they would otherwise never meet. It is the essential vehicle of marriage, education, recreation and trade. It promotes the international cross-pollination of ideas, arts, technologies and philosophies. It breaks down the walls of mistrust between families and nations. It evaporates the mists of time, distance and cultural difference. It is only when people of different kinds and cultures mix that renaissance can unfold. In fact, the erratic alternations of dark age and renaissance within global society are probably all part of its overall complex dynamical behaviour which, like that of the weather, could be represented by a strange attractor. The laws that govern the motion of the atmosphere create an energy barrier to protect the integrity of its tiny molecular components. So too should the rules that regulate society ensure that the macroscopic turbulence of its corporate endeav­ours can neither hurt nor destroy any of its smallest components. 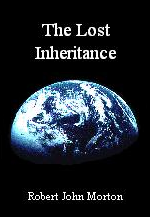 These rules should place the rightful inheritance of each of the Earth's one billion families be­yond the possibility of violation. In the micro-physical world, the force between two constituent particles in a mole­cule is normally related to their spatial separation. For some forces, strength is inversely proportional to the square of the separation between them. Such forces are thus said to obey an inverse square law. The strengths of other forces seem to increase as a pair of particles are pulled further apart as if the particles were joined by an elastic band. A web of constructively-opposing forces thus permeates the universe. The points, lines and surfaces of equilibrium between opposing forces obeying dif­ferent physical laws thus give form to particles, atoms and molecules. They set limits on their sizes, masses, charges and energies. They shape their modes of behaviour and restrict the vigour with which they may interact. Each unilaterally obeys its given laws. He is his own policeman. He seeks not gain for himself without limit. He seeks not to deprive or destroy his neighbour and take the spoil. The result is that all the molecules that make up the global atmosphere interact with each other in a way which, although exceedingly complex and seemingly cha­otic, is nevertheless stable and self-regulating. This is because, whenever the sys­tem is perturbed, the laws that relate how a molecule interacts with its neighbours always tends to pull the weather's behaviour back towards the norm represented by its strange attractor. Such a set of laws is said to be convergent. However, if the laws were changed slightly, the delicate balance of the system could be upset in such a way as to initiate a mode of behaviour which would result in the whole atmosphere exploding to infinity or collapsing onto a point. The laws would then be said to be divergent. A system that is governed by divergent laws has only a transient existence. It may in some cases be a long existence, but it is bound eventually and inevitably to self-destruct. Human society is also formed and governed by natural laws. Individual human be­ings interact with each other in deterministic ways. However, the natural laws that regulate these interactions are divergent. Under the influence of these laws alone, therefore, human society is inherently unstable and inevitably self-destructive. The natural single force-from-within, which subconsciously drives all human inter­action, is basically selfish. Its sole aim is to provide for and protect self. It is the fundamental law of self-preservation. However, this law not only forces me to pre­serve myself in the physical sense, but also in a genetic sense. It compels me also to provide for and protect my family. My family is thus a part of what is called my extended self. My motive is still selfish. Furthermore, inasmuch as my neighbour is a part of the socio-economic environment, which provides me with the means to provide for and protect my family, I am moved also to provide for and to protect my neighbour. But my motive in so doing is purely selfish. I am not thereby "loving my neighbour as myself". I am simply exploiting him for my own gain. A master provides for and protects his slaves. But this is only because he knows that, if they starve, he will have to do all the work himself. A conscript may fight for his country in time of war. But this is because he knows that, if he refuses to fight, he may be shot or imprisoned by his own State or at least suffer the rejection of his peers after the war is over. At best it is because he fears that, if his country be conquered, he will be enslaved by the conquerors. Again the motive is entirely selfish. But the primeval force which drives the human life-form's built-in self-preservation programming does not restrict itself merely to making adequate provision for its host and his dependants. It does not have a negative feedback mechanism to enforce a strict upper limit on its gain as does the amplifier in my short-wave radio receiver. In its raw state it engenders an insatiable ambition to possess and control. It generates an avaricious desire to gain and hold on to more than it could ever need. It begets a voracious appetite to consume without limit. It incites a craving to covet and take what others possess. It bares a predatory eye of envy towards their wealth and happiness. It lusts for that which is forbidden. It wishes death upon all who would stand in its way. Its name is greed. Greed is the subconscious seat of human nature. It is the life-blood of modern free-market capitalism. It is vital to human existence. Without it, mankind would not have the incentive to do what is necessary to live. But unbridled, it will eventually destroy the world. All human beings are driven by this primal force of greed. Although not all to the same extent. The result is a tension-ridden society made up of a myriad greedy individuals locked in constant competitive struggles, which are at any given time in varying stages of conflict and stand-off. A small degree of restraint is inherent. An individual may refrain from a particular selfish action for fear of the retaliation or reprisal, which would be returned by those to whom the action would be directed. However, this does not deter strong or unscrupulous people from oppressing those who are weak and honest. So the col­lapse of society is still inevitable. The behaviour of unregulated human society is not convergent. 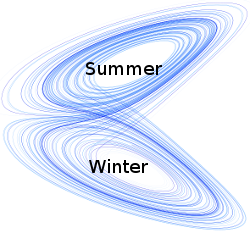 It is not held in the orbit of a stable attractor. It is destined quickly to explode or collapse. But human society is known to have existed for at least 6,000 years. Something has prevented - or at least severely slowed down - its progress towards oblivion. One of the things that has slowed down the process considerably is the fact that, until recent times, the population of the world was small in comparison with its land and resources. It hadn't yet reached critical mass. The oppressed could still move on. Another is that communications on a global scale were slow. No skirmish could instantly escalate to global proportions. Nations could consider events without being driven by them. Time and space could dissipate tension. The main factor that has contained the forces of self-destruction within human soci­ety, however, is its use of rules. Rules limit and reshape an individual's motives before they are allowed to be real­ised as physical or intellectual actions towards his neighbours. Only such processed actions are thus allowed then to become real causes of real effects within society. Any arbitrary set of rules can be imposed by a society on its members. Any arbit­rary set of rules will alter the overall effect of the natural laws of cause and effect, which are built into the human mind. Different sets of rules will have different overall effects. What overall effects must these rules produce in order to create and maintain a just and fair society? The first effect these rules must exhibit is family protection. They must preserve the social and economic integrity of each individual and family on Earth, and secure unconditionally every family's title and possession of its rightful portion of the planet's resources to use as it will. The second effect these rules must produce is social mixing. They must shape the global behaviour of society in such a way that it produces the right balance between socialisation and solitude - calm and chaos - for every individual within it. To facilitate social mixing, society must contain a degree of turbulence. But however turbulent society may become on occasions, the rules must make its overall be­haviour pull continuously and automatically towards a stable norm. In other words, these rules must bring the divergent laws of human interaction into a state of con­vergence. Where do we find a set of rules that will produce these desired effects? The eternal quest of science has always been to find the Universal Law of physics. That is, a single unified law which describes completely the whole of reality. The ultimate successor to the Unified Field Theory. A single equation which replaces all others. But such a law, if it exists at all, has always eluded scientists, and it probably always will. The same would be true of mankind's eternal quest to find the Universal Rule of Life which, if followed, would create and sustain a just and fair society. Would be that is, if mankind had been left to find it for himself. But he wasn't. It is, in fact, already built into his conscious awareness. It is commonly known as conscience. If human society were purely a complex dynamical system like the weather, all hu­man beings would have exactly the same strengths and abilities in equal measure. They would also necessarily be subjected to exactly the same environmental, social and economic circumstances. In this case, every greed-motivated action on the part of one person would be met by an equal and opposite reaction from his neigh­bour. A state of equilibrium would then emerge in which society could probably function equitably without rules. But this would be a stagnant society in which members would have no sense of interdependence and therefore little reason or motive to interact or communicate, let alone co-operate. Human relationships would not form, so society would not really exist. Real human society, however, is not a pure complex-dynamical system. This is because its basic elements - human beings - have some aspects that are unique to each individual and others that are unique to groups or classes of individuals. These differences play the same role as the forces that cause molecules and atoms to interact in the atmosphere. In the real world, people's strength and ability profiles vary considerably. And the circumstances in which different people find themselves differ even more. In any encounter, one whose natural strengths lie in his ability to negotiate will always have the advantage over one whose str­engths lie in artisanry. The latter will al­ways end up short-changed. The inher­ent turbulence of nature and society guarantees that no two people's circum­stances are ever exactly the same. In fact the difference can often be so great that one person's very survival could depend on what only another can supply. In the real world, therefore, social and economic disparity is inevitable. But that does not make it right. Mankind is therefore morally obliged to seek out and apply a Universal Rule of Life, which will eradicate disparity while at the same time ensuring personal fulfilment for every individual. This demands that we must accept that different people have different natural talents and abilities in different measures, and that they develop interests in different things. This is vital in any society in that it encourages and necessitates mutual inter­dependence, communication, co-operation and consequently establishes, builds and holds together billions of personal relationships. It thus creates and sustains the fabric of society. But it also gives some their undeserved advantage and thereby is the very creator of disparity. But the reason it creates disparity is because each individual applies his own talents and abilities predominantly for his own benefit. He may be using some indirect channel such as applying his skills on behalf of a customer or employer, but this is simply a means of getting money for himself. His motive is predominantly selfish. His motive is therefore in direct opposition to that of every other human being on the Earth. One cannot blame him. After all, that is the way his brain is wired. The very nature and structure of his human form only allows him to see the world from his own point of view. It is therefore not surprising that he can only think of it in terms of his own position within it and how it affects him personally. A human being is simply not equipped to see the world from the point of view of, and in terms of the experience of, another human being. Given the restricted senses of the human body, and the self-seeking nature of the human mind, the presumption that one human being can see things from another's point of view is an unfortunate and destructive illusion. This is because most people do not heed their consciences. For each to vote freely and independently, in good conscience, is a necessary condition for democracy to work. Unfortunately, the consciences of the vast majority are hijacked by State pro­paganda, religious deception, biased education and corporate advertising. The precious few who do heed their consciences are officially reviled, religiously con­demned and socially ridiculed. This is why, in today's society, democracy fails. The seat of the human conscience is a rule that probably has never been better expressed than in the divine admonition: "Love thy neighbour as thyself." This is, of course, expressing a truth that every human mind inherently knows. It is simply there. Everybody knows that this is how they should behave in order for society to work equitably and benignly. It is the all-encompassing principle which, if followed, would pull the divergent natural laws of human interaction into perfect converg­ence. The problem is that the natural human mind as it stands is not equipped with the wider perceptions and enhanced motivation it would require to empower it to follow constantly and unfailingly this foundational rule of life. Therefore, even if every human being on Earth wished above all else to follow it impeccably, they are, as a direct result of their inherent natural human shortcomings, ultimately bound to fail. For success to become possible, every human ego would have to undergo a quan­tum leap in spiritual evolution. It would have to become entirely conscience-driven. Then, no matter what a person's particular talents were, they would be applied equally and fairly to the benefit of both himself and his neighbour. And conversely, his neighbour's talents would be applied equally and fairly to both of them. Both would therefore benefit equally from both sets of talents. Both of them would be intellectually and professionally fulfilled in that they would both be putting their different talents to good purpose. Disparity and conflict would be self-eliminating. Unfortunately, until such a quantum leap takes place, an external device must be set up that is able to capture every incident of failure and take the remedial action necessary to hold society within a pseudo-equitable modus operandus. This neces­sitates that something be added to the rules that embody the universal principle "Love thy neighbour as thyself." That something is a remedy for failure. 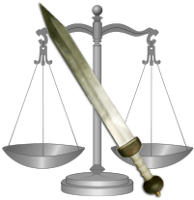 A law is a device which relates cause and effect. It is an intrinsic part of the fabric of the universe. A rule is a filter which limits permitted personal actions to only those which, as causes, will produce only be­nign effects. In other words, effects that will uphold social equity. A remedy is what a transgressor must do for a victim to compensate the victim for the bad effect he has suffered as a result of the transgressor's violation of the rule. Rules and remedies are not natural components of human instinct. A baby is not born with them already uploaded into memory. Nor are they passively absorbed from one's normal experiences and observations of life. They have to be proactively taught. Proactive teaching necessitates a global educational infrastructure to diss­eminate them from an original source. Violations of the rules have to be detected. The corresponding remedies have to be enforced. These necessitate a legal infra­structure to arbitrate between violators and those who suffer their consequences. Unfortunately, with this arrangement, both detection and arbitration are subject to the limitations of the human senses and the imperfections of human perception and judgement. Error is inevitable. To a large extent, therefore, fairness and equity must abide within the lap of providence. Nevertheless, if it be the express wish and determination of everybody to live by that Golden Rule, a fair and equitable society should emerge. The vital point is, however, that everybody in the society must want to. Furthermore, for it to work at all, such a society would need some form of uni­versal means through which its citizens could freely interact and through which its educational and legal infrastructures could function. Rules and their remedies serve no purpose unless they are enforced. Enforcement necessitates the existence of some kind of agency that has the ability to apply overwhelming physical power over the individual. That agency is the Sovereign State. But a Sovereign State rapidly and inevitably becomes the instrument of a small self-interested elite. This small elite use the power of the State to extract taxes from the people to multiply their power over the people. They shape the rules and remedies to favour themselves. The majority thereby become their slaves. They replace the natural conscience of each individual with the collective con­science of patriotism, in which each gives up his power to make moral judgements in unconditional obedience to the will of the State. The State education system ex­trudes into his mind the approved common culture of values and beliefs. All thus become stamped with the standard national mindset. This is a society in a dark age in which thought has stagnated and progress has ceased. All now think and act as one, following the same bare daily routine of working, eating and sleeping superimposed upon a bare annual cycle punctuated only by a quick summer holiday and Christmas. Gone are the complex dynamical interactions between a myriad independent minds. In its place has emerged the cold regimented conformity of a quantum-mechanical fluid. Quantum mechanics tries to describe the events and mechanisms by which energy is emitted and absorbed in discrete amounts by atoms and other nanoscopic en­tities. I use the term here, however, to denote the underlying collective behaviour these little mechanisms exhibit when unperturbed by thermal agitation. At the temperatures with which we are familiar, the molecules of matter move or vibrate vigorously. Their motions are random and chaotic. They are free citizens - independent spirits. Each can take his own unilaterally-determined path within the bounds of physical law. All are free to mix and interact. It is only in this benign state that matter is able to host the processes of life. But when a fluid like helium is cooled to within a few degrees of absolute zero, roughly −273°C, its molecules seem to lose their independence. Each no longer follows his own unilaterally decided path. All molecules seem to move together in unison. They become like a flock of sheep, all following whichever of their number happens to move first. This gives rise to strange effects. 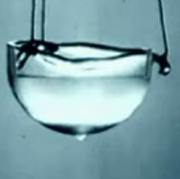 For instance, liquid helium starts to crawl up the side of its container. Independent complex dynamical behaviour has broken down. Purists may disagree, but I do not think these quantum mechanical effects are limited to the nanoscopic world of atoms, molecules and elementary particles. A few generations ago, the pendulum clock was the norm. It was then that clock makers witnes­sed a remarkable phenomenon. 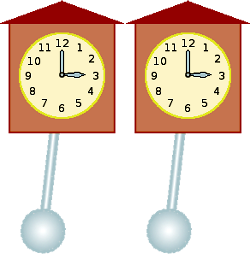 The pendulums of a group of identical clocks on a shelf, after they had been together for some time, would be seen swinging in perfect synchronism. It is very unlikely that they would have started off that way. The clock maker could only set the clocks going one at a time. The swing of each pendu­lum would therefore start off in a random phase with respect to any of the others. It was as if there were some kind of mysterious linkage be­tween the pendulums, which somehow gradually pulled them into synchronism. I think that the essence of quantum-mechanical phenomena is linkage. In other words, quantum mechanical effects are observed when the linkage between the elements of a complex system is great. Chaotic effects are observed in the micro­scopic world when that linkage is reduced by thermal agitation. Linkage must not here be confused with communication bandwidth. Bandwidth con­cerns the ease and rapidity with which independent systems are able to exchange information. Linkage is the degree to which the individual has relinquished indep­endent control of himself and passed it to the collective of which he is a part. In the animal kingdom, one may cite the sheep as a quantum mechanical animal. When one moves, all its peers move with it. The one that moves is not in any sense a leader. It is simply the one that moves first in response to a noise or movement, which it perceives as a signal of danger. A cat, on the other hand, is fiercely independent. It does not tend to follow the crowd. It thinks for itself. It takes unilateral action. The human can be either. Each is equipped with a 200 billion neuron brain. It can think for itself at practically any level from the trivial and mundane to the exotic and abstract. It can choose, in any instance, to go its own way or to follow the crowd. Consequently it can form societies that are either complex dynamical or quantum mechanical in behaviour. 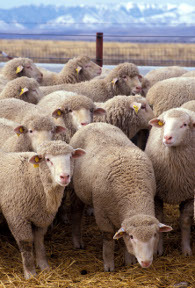 In the realm of political opinion, I think, most members of the human race behave like sheep. They exhibit a quantum-mechanical behaviour. They become over-con­nected to their so-called leaders. This is not through lack of intellectual freedom or mental dexterity. Under capitalism, each has to work all hours to gain the basic means to perform acceptably as a member of the socio-economy in which he is trapped. At the end of his stressful day, he has no time, energy or inclination to ponder the rights and wrongs of moral and political issues. All he can manage is to imbibe the oven-ready propaganda, which spews continually from the mass-media spin machine, which his leaders use to keep his mind imprisoned within their web of deceit. His political opinions are thus formed for him. They are shaped by the constant drip, drip from the pages of his politically aligned newspapers and establishment-influenced broadcasts. Sadly it is few who dare to think for themselves and question the status quo. Each political bloc on this planet is thus like a quantum mechanical fluid - a society of mindless sheep. The vast majority of individuals, within a nation, thus march as one - like the atoms of super-cooled helium. Global society thus comprises a mere handful of independent political blocs. Their number is too small to be statistically significant. Besides, it is dominated - nay monopolised - by just one: Western Cap­italism. Whatever the merits or faults of Western Capitalism, monopoly is an un­healthy situation. It is the very essence of a dark age. To be healthy and fulfilling for each individual, society needs to be complex dynam­ical in character right down to the level of the individual. Each must be connected to society, but not to the extent of relinquishing his independence of thought and action. Society must allow him to determine his optimum proportions of social­isation and solitude - of conformity and diversity. This prerogative must be upheld by the very protocol through which all individuals in society interact with each other. And that protocol is summarised perfectly in the words "Love thy neighbour as thyself". But alas, this is not the way it is. In this present age, the govern­ments of the Sovereign States of Planet Earth imprison their people in the same monolithic mindset, their shallow thoughts marching, one and all in quantum-mechanical unison, like the trudging trog­lodytes of Metropolis.